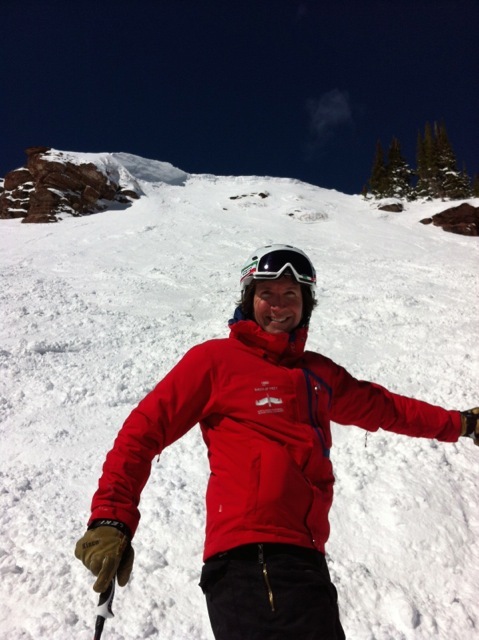 Gabe Del Rossi is from Stow, Massachusetts and teaches skiing out of Vail Village. Q: How long have you been an instructor for? A: I have instructed in Vail for five seasons but before this I instructed for a few winters in Europe at Courmayeur (in northern Italy at the foot of Mont Blanc). A: I was (and still am) a university professor. I teach Italian online for Plymouth State University in New Hampshire. I finished undergraduate and graduate education in Boston, and from there I commuted to New Hampshire to teach face-to-face courses in Italian. When I moved to Vail they asked me to continue teaching online. I currently ski instruct during the day and then go back at night to set up assignments and check student work. Q: Where did you learn to ski? A: I learned to ski in Waterville Valley, New Hampshire at the age of seven years old. I also skied the smaller resorts in central Massachusetts as well as some of the bigger ones in Vermont and Maine. A: I spend about mid-April to mid-November in Europe working for Trek Travel, a bicycle tour company. We take people to major mountain passes, tour around France, Italy, Belgium, Spain, Switzerland, Czech Republic; you name it. I’ve been leading tours for over twenty years. In the summer, Sicily is my home base since my wife is Sicilian. A: I speak Italian, French, and Spanish. My Portuguese is not bad either, but I’d say Spanish is my largest request here at Vail. Out of all my clientele, I spend about 90-95% of my time in Spanish. Q: Where did you learn all these languages? A: My father’s side of the family is Italian, so my godparents taught me all kinds of Italian words through culture and food as well as how to argue during the holidays. I just fell into it since I wanted to know about my heritage and where my family comes from. I studied Spanish in high school but never fully applied it until coming to Vail. French I learned when I moved to France to study French literature and to work as a regional manager for another bike tour company. I have a graduate degree in Italian literature, but while in France I got a second masters in comparative literature (with a concentration in French and Italian Literature). Q: Why did you choose Vail as opposed to somewhere else? A: During one of my bike tours I had guests that were from Vail and they kept telling me to check out the valley. They would travel with me every summer and each year insisted that I come visit them and teach out here. So one year I decided to come to Vail for a visit. I hung out here for one week and it was the biggest powder dump I’ve ever seen. It snowed every day. I skied everywhere and was amazed by the terrain, the trees, the mountain culture, and the likeminded people. People in Vail are from all walks of life and have ended up here for whatever reason. I just fell in love with the mix of locals and people from other backgrounds. My last day before leaving I spoke to the Vail Village supervisor and we kept in contact over the summer until he sent me a contract. A: I really love the moment when people are nervous and concerned before doing something new. Then you convince them they are able to do something and they do it. It takes a leap of faith, but their understanding and learning expands in huge amounts. It just goes to show how much our minds can limit us to the amount of things we can accomplish. That’s the most inspiring thing: we are confined by our own mental/emotional barriers until someone is there to say, “come on down!” Until then, we don’t fully understand what we are capable of doing. I often think of what limits I impose on myself, and what I could accomplish if I just jumped. Q: What is the hardest part of teaching? A: I meet people from all over the world: South Africa, Scotland, Brazil, Argentina, Paraguay, and a number of major US cities. I once taught an eleven year-old boy from Mexico City who had open-heart surgery and still loved skiing. He had, in my opinion, one of the most inspiring and interesting motivations to continue skiing: he loved having fun regardless of his physical condition. A: I once had a student with epilepsy from northern England who came all the way down on a bus to Courmayeur. Because it was an overnight bus she was super tired which triggered her seizures even more. When she arrived she was having massive fits, so we had to get her to a hospital to give her an injection before she could ski. She ended up being my student and I had to keep her on a harness on the chair lift and we had so much fun. We got closer with every day and I learned so much from her. For me, it was a game changer to put myself in her boots and be sensitive to what was going on for her. She loved the skiing experience so much. The most inspiring students are those that have these kinds of limitations and yet don’t limit themselves. We as adults set boundaries for ourselves in so many ways despite being capable of so much. A: Have fun. Look around you. Eat the beef brisket. It’s not just about getting downhill; it’s about the whole mountain experience. A: My perfect day in Vail would be spending the morning sledding with my daughter who is sixteen months old, having lunch with my wife and my daughter at Sweet Basil, skiing in the afternoon with my friends, then skiing to Minturn and drinking with my friends at the Saloon. A: My favorite run is, “not on the map.” However I really like Champagne Glade on a powder day. A: There was no Burton half-pipe when I started. Taking kids through the half-pipe? Now that’s impressive. The amount of knowledge here, for future, present, and past, is unparalleled. If you’re looking at a new ski technique or looking to be on the cusp of bettering your bump skiing or looking to know what’s going on in town for the music scene or looking on at the Burton US Open or Birds of Prey, or you want to know how skiing has developed for the past fifty years, or are interested in the biomechanics of skiing: this is the place to be. Just think about how one small Colorado town can become what it is today in such a small amount of time. Get to Know John Donovan: Vail Resident, Business Owner and Ski Instructor Since 1963. Get to Know Ben Donnelly: An Adaptive Snowsports Instructor.